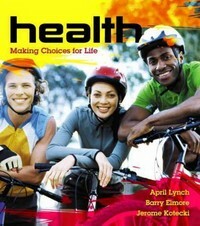 Health 1 Edition &>Built by students for students. Health: Making Choices for Life distinguishes itself by speaking your language and helping you to apply the material to your life and implement real behavior change. Built from the ground up with student-generated content and incorporating technology that students use, this is the health book that you can relate to—the one that will inspire you to choose a healthy lifestyle. The student-savvy approach is demonstrated in many different ways throughout the text and is built on an ultra-modern, magazine-style design with appealing photos and visuals that encourage you to read. Additionally, student stories in both the text and online provide real-life examples of important health issues. Unique, practical tools like the Choosing to Change Worksheets walk you through the steps of behavior change and help you to make informed decisions about your lifestyle choices. Lastly, the authors employ a conversational writing style that speaks directly to you while maintaining quality content and excellent academic rigor. Note: If you are purchasing the standalone text or electronic version, MasteringHealth does not come automatically packaged with the text. To purchase MasteringHealth please visit www.masteringhealthandnutrition.com or you can purchase a package of the physical text + MasteringHealth by searching for 0321982703/ 9780321982704. MasteringHealth is not a self-paced technology and should only be purchased when required by an instructor.